But process mapping had little use or impact in Professional Service firms until comparatively recently. Why is this? Simply because process thinking is not applied in most professional service firms. The culture in professional service firms is practitioner-focused and typically does not see the service provided as ‘a process’. However this is changing due to increasing competitive pressures over the last 5 years. Firms are under increasing financial pressures driven by price-focused clients and alternative providers (some enabled by deregulation as in the UK legal market; some by the internet and others by globalisation). They are having to improve their efficiency – ‘doing more with less’. ‘Doing more with less’ has often been a synonym for redundancies rather than any systematic approach to improve efficiency. Indeed an unstructured approach to redundancies in a service organization can backfire with service quality being impacted and professional morale lowered. A first powerful step to improving efficiency is looking at how work is performed today and to determine what improvements in efficiency could be made. This is the so-called ‘AS-IS’ phase of a re-engineering programme. In our re-engineering work with major UK professional service firms, the process mapping stage is a key element in giving a shared view of how things are done today. This is especially important in a professional service environment as the process (be it a client service or a back-office activity such as client inception or billing) is not immediately visible. In a factory a process can be viewed by simply walking across the shop-floor. However a tour through a law, accounting or consulting firm’s offices will not unearth much evidence of processes among the employees, desks, computers and (usually) lots of paper. 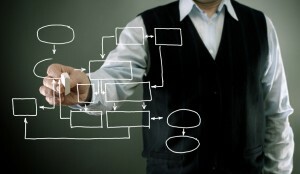 Process mapping makes the ‘invisible’ processes in professional service firms visible. Once processes are visible they can be analysed and improved. So mapping is a key foundation for improvement. Effective process mapping is performed collaboratively using paper and pen – rather than computer – as this enables easy collaboration. Effective mapping requires the involvement of representatives of those personnel who perform the process/service being mapped. The objective of the ‘AS-IS’ mapping is to capture the process as it is actually performed today. In a service environment it is important to identify key tasks, who performs them and the amount of chargeable and elapsed time consumed. It is also important to include those routinely performed activities which represent waste – such as delays, reviews, corrections, duplication and different methods used by teams and offices. Once the paper-based model has been completed, it can be captured by digital photo or better still converted into a software-based model using a tool such as Microsoft Visio – this enables easier modification, distribution, review and archive. Process mapping is a powerful tool for business improvement and professional service firms need to add it to their improvement capabilities. You are currently browsing the Codexx blog archives for May, 2013.